The townhouse style apartment is split over 2 levels and features 3 large bedrooms, 2.5 Bathrooms, a double lockup garage, private courtyard and balcony, reverse cycle air conditioning, a large fully equipped granite kitchen and a separate lounge and dining rooms. This Sydney Serviced Apartments is perfectly situated close to the Artarmon train station, Chatswood shopping and business centres and the Warringah Freeway which provides access to the Sydney CBD, Circular Quay and Sydney Opera House within 8 minutes. Great value for money townhouse accommodation for large families and groups staying in Sydney North Shore. 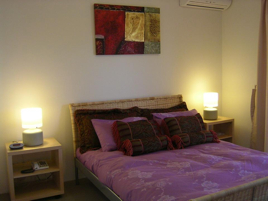 The Townhouse accommodates comfortably up to 10 people in 3 bedrooms and lounge room. Conveniently located to Artarmon railway station, easy access to both Sydney CBD and Homebush Bay Olympic Park. Great position on a very quiet and leafy cul-de-sac in Sydney`s Lower North Shore, we are close by to the major corporations of the North Shore and within a few minutes to the famous shopping centres of Chatswood, including Westfield and Chatswood Chase. This Sydney apartment is only one traffic light away from the Sydney Harbour Bridge, Chatswood Shopping complex is one train station away and you don`t have to walk far to find excellent restaurants, bars and cafes..
Our apartment accommodates a maximum of 10 people. The townhouse includes reverse cycle air conditioner on both levels, large fully equipped kitchen with granite bench tops opening out to a sunny private outdoor courtyard. The second level of the Townhouse contains a master bedroom with en suite and a large balcony with a lovely outlook, two Queen rooms and a twin Single room. All bedrooms have built in wardrobes. There is a large lounge area, which contains a double and single sofa beds. Everything is included for a comfortable stay, beds are made up with fresh clean linen. All the linen and towels are provided. The apartment is only serviced before and after the booking. For longer stays weekly servicing can be arranged at an extra cost. Cancellation if caused by the client, money paid is not refundable unless the house is re-let for the entire period. If a refund is made due to the property being relet then a AU$50 cancellation fee will apply. Amendments - moving dates booked, reducing number of nights booked, no shows and cutting short stays are all forms of cancellation and therefore cancellation policy applies. An exception to this policy may be granted for any reasonable request and is up to the discretion of the owner.